PLEASE ALLOW UP TO A FEW DAYS BEFORE SHIPPING. UltraSonic Cleaning is the worldwide standard for cleaning many types of objects, including jewellery, surgical instruments, motor parts, golf clubs, and plastics. Now Jayhawk is proud to introduce this technology to Bowling Balls. The Detox is the next generation of bowling ball de-oiling and cleaning. It uses ultra-sonic technology to penetrate the cover for the ultimate de-oiling process. 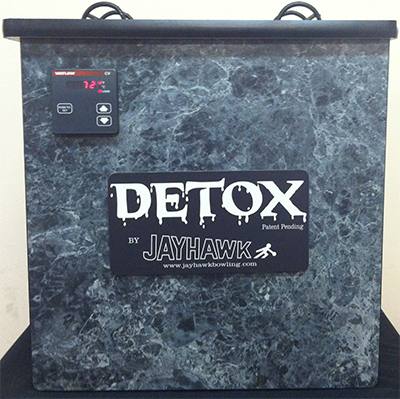 Not only does the Jayhawk Detox clean deeper and quicker, it does not subject the bowling ball to extreme temperatures over 125 degrees that can damage a ball and void factory warranties. Most other oil extraction devices from ovens, to hot water baths, to dishwashers and streamers subject the ball to temperatures in excess of 125. Not only is the Detox safer to Bowling Ball cover stocks, it works quicker than most other devices which help Pro Shops generate additional revenues. Help your bowlers get the Snap back and increase their scores and give their old ball new life while increasing your revenues. Please watch the Detox Video to view the deep Ultra-Sonic oil extraction technology in action.